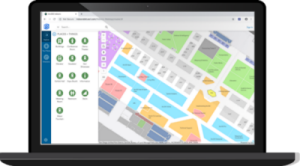 ArcGIS Indoors Web allows you to find a location or resource within a building or site that includes several buildings. Once you find a place you are looking for, you can choose to get directions to that place to plan your travel time, or use it to log an issue for a fix or replacement of an item with Survey123 for ArcGIS. The Indoors Web suite consists of a browser mode and a kiosk mode. Browser mode—For organization members to use from a computer or device with a browser. Kiosk mode—For visitors to use from a touch screen monitor or tablet device placed at reception areas. This guide helps you deploy Indoors Web as a configurable app template on your ArcGIS Enterprise portal. The following are the steps to configure Indoors Web for a web browser. Configure the web map (only if the web map uses a map service). Configure 311 to integrate Survey123 (optional). Optionally set the home location (only if it wasn't already set in the portal). The following are the steps to configure Indoors Web for a kiosk. Set the home location (for anonymous guest use).